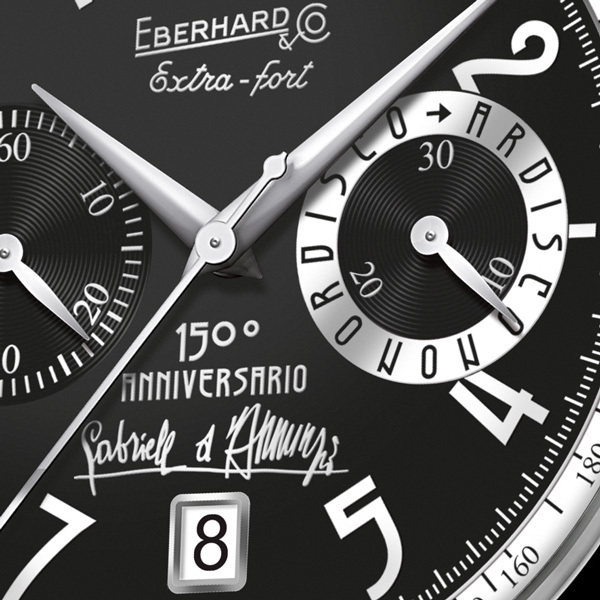 The watch-making company Eberhard & Co. pays tribute to one of the greatest interpreters of nineteenth-century Italian literature, admired throughout the world: Gabriele D’Annunzio. The 150th anniversary of the author’s birth has been celebrated with events dedicated to the poet’s literary production, taste and aesthetics and the Swiss company rounds off the celebrations with a special limited edition of one of its most representative models, the Extra-fort “Ardisco non ordisco”. Born in Pescara in 1863, D’Annunzio was one of the most prominent protagonists on the European cultural scene between the 19th and 20th centuries: a poet, novelist and playwright, but also a politician, soldier and aesthete, a socialite, a modern personality who lived his life like the “superman” that he portrayed in his works. Driven by the ambition to fulfil this role under any circumstance, he was one of the most fervent interventionists during the 1st World War, in which he played his role despite being over fifty at the time. He took part in many risky military actions: the air raid on Pola, the flight over Vienna, the Bakar mockery and especially the occupation of Fiume. The latter operation figured in what was to become one of the most famous of D’Annunzio’s sayings, “Ardisco non ordisco” (I don’t plot, I dare), an open challenge to government and institutions, but also the expression of a determined man with firm convictions, an extraordinary personality who dominated the literary and political scene of the period. The author’s sensitivity and attention to evolution and the man’s modernisation process is evident in his literary output – a blend of classical and contemporary texts in a refined, noble style - and in the life of the “Vate” (Poet), always attentive to technology, mechanics and innovation. “O rinnovarsi o morire!” (Man must either renew himself or die); this neatly sums up D’Annunzio’s entire career, characterised by a continuous “renewal” of forms, themes and modes bearing witness to the futuristic influence of those times. 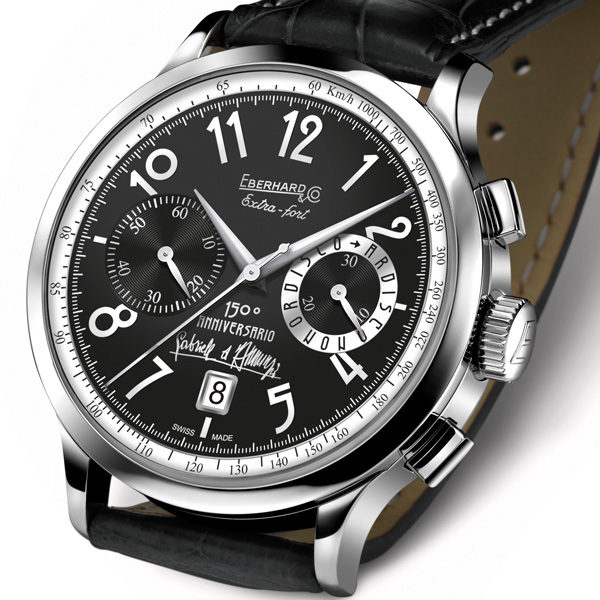 These same values link Eberhard & Co. to D’Annunzio: the same sensitivity and technical research that the Swiss watchmaker puts into creating its collections, always connected with the contemporary man’s evolution. Watches of timeless character, an expression of the marriage between a tradition that is over a century old and constant innovation, both technical and aesthetical. The close link between Eberhard & Co. and Gabriele D’Annunzio is cemented by a great love for the world of motor sports and one of its greatest personalities: Tazio Nuvolari. The poet was a friend and supporter of the driver, one of the greatest of all times. Both avid fans of speed and challenges, the two personalities, completely different and distant but bound by friendship and mutual respect, met in 1932, when D’Annunzio gave the driver one of his photos with a dedication and a little gold tortoise with the words “For the fastest man in the world, the slowest animal”. This tortoise, the driver’s lucky charm, can be found on the dials in the collection of Tazio Nuvolari chronographs dedicated by Eberhard & Co. to the “flying Mantuan”, a motor racing legend. From driver to poet. 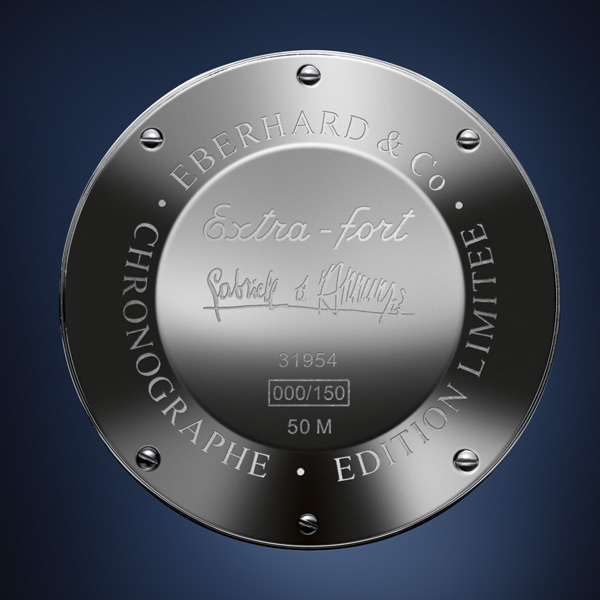 This time Eberhard & Co. is paying tribute to the author from Pescara with a brand new interpretation of the Extra-fort model, produced in an edition that is limited to just 150 pieces, to celebrate the 150th anniversary of D’Annunzio’s birth. An automatic chronograph with elegant and harmonious lines, a 41 mm steel case and a face that reflects the great personality of the man to whom it is dedicated: black with white contrasts, personalised with the author’s signature, the 150th anniversary date and the famous motto “Ardisco non ordisco” - in a Liberty style font – adorning the profile of the 30 minute chronograph counter at 3 o’clock. D’Annunzio’s signature is also etched on the back, which is closed with 6 screws. 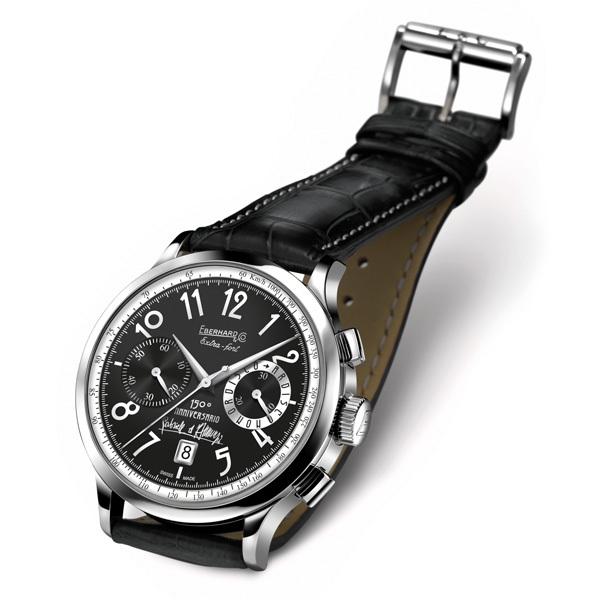 50 m waterproof, this special Extra-fort is available with a crocodile strap or “Chalin” steel bracelet. Thickness of the case: 13.90 mm. Strap: black crocodile. Steel buckle personalised E&C.